Its been some moons ago that this happened, but its until now that the Site Admin have some time to post pictures about it. Being in the Air Force, he went on one of the early-bird days before the actual event was open to the public. Boeing KC-135R, ex-USAF 63-8016, manufactured as 18633/672, first flight 28th Jan 1964, delivered on the same date, sold to RSAF in 2000. 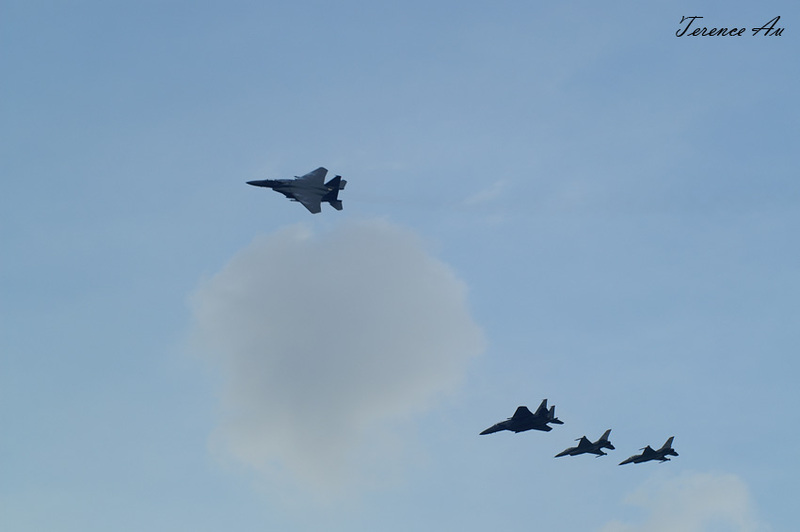 One of the oldest birds that the RSAF have.. 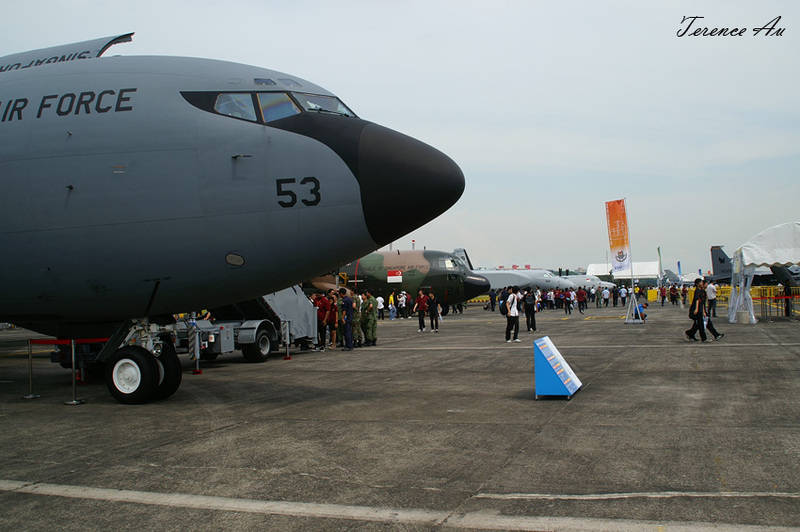 The Boeing KC-135R is fitted with the Boeing Multi-Point Refueling System (MPRS), enabling simultaneous refueling of F-16 and F-15 aircraft via the flying boom and F-5 S/T Tiger II aircraft via these drogues, sometimes known as the ‘Basket’ from pilots..
Fokker 50 Maritime Patrol Aircraft fitted with a captive (training purpose) AGM-84 Harpoon anti-ship missile. 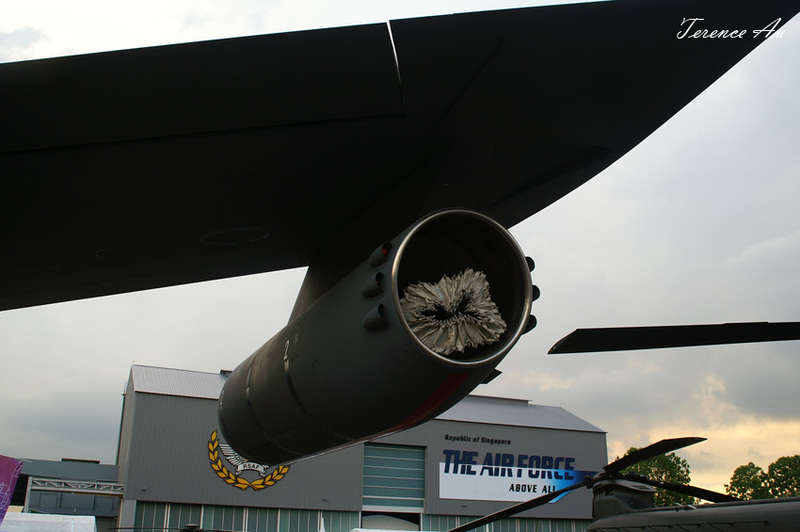 The AGM-84 carries a 490 pounds (221 kilogram) warhead and propelled by a Teledyne turbojet engine with 2.9 kN thrust. 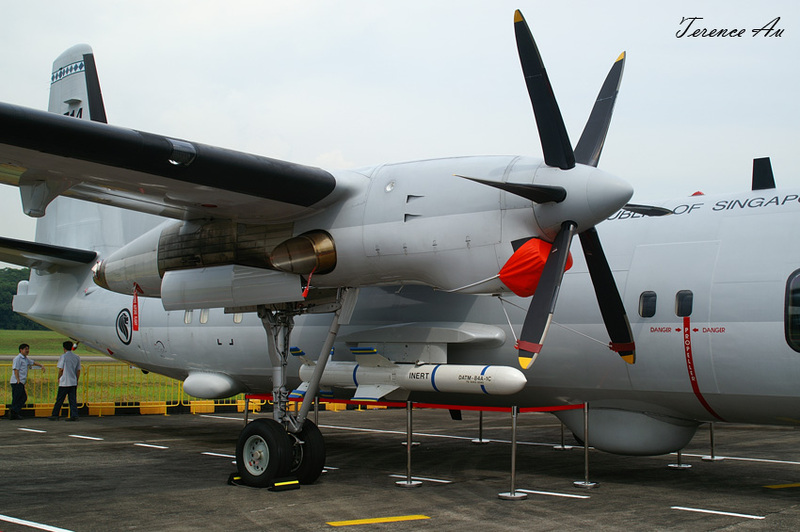 MPA aircraft are often fitted with armaments; it is one of the areas which the Site Admin is interested to explore in, the possibilities of arming larger military aircraft for self-defense/strike purpose. The other example is the Nimrod MR.2, which carries nine Stingray torpedoes, Harpoon anti-ship missiles like the above and depth charges. In the operation against Argentina in the Falklands War, the Nimrod MR.2 was also fitted with Sidewinder missiles (possibly the AIM-9L), as the Nimrod encountered the Argentinian Boeing 707 Anti-Surface Unit Warfare (ASUW) aircraft. The Sidewinders fitted were not only to take the ASUW aircraft out, but also to boost the confidence of the crew as they operate long hours in hostile airspace. In the end the intended use did not come to fruition [information from HPC Publication/Air Pictorial Dec 2001/Jan 2002]. 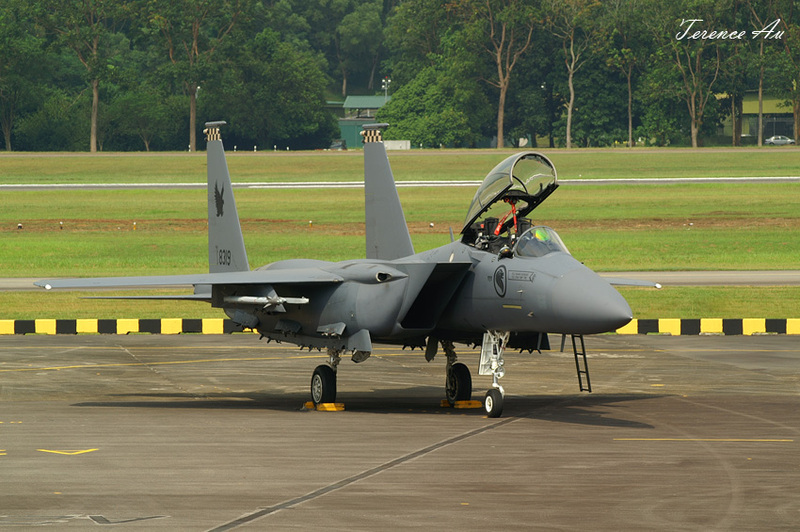 The lineup of aircraft for the mock scramble later on..
8319, a F-15SG Eagle. 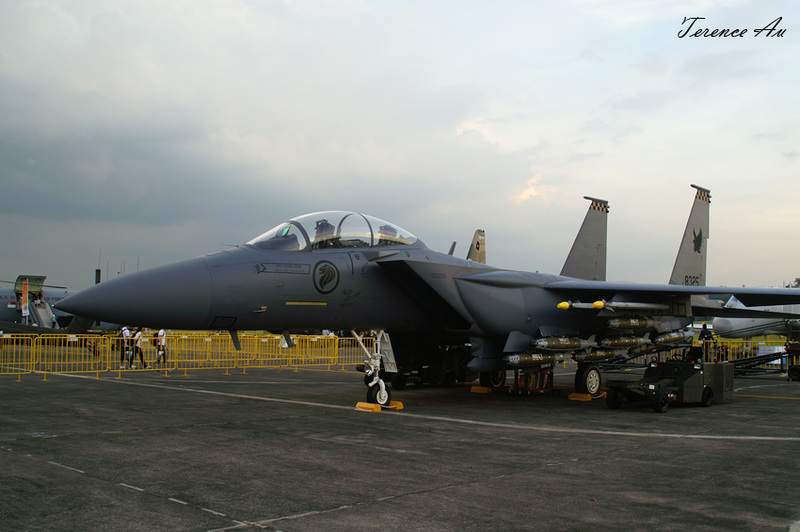 SG is the designation for RSAF Eagles; in the USAF they are known as the F-15E Strike Eagle. 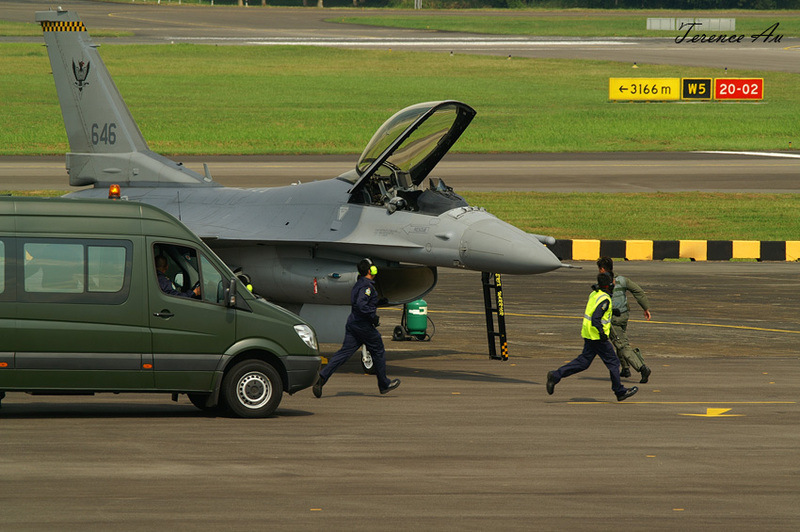 SG Eagles are fitted with conformal tanks by the sides of the air-intakes and airframe procurement started from 2006. The aircraft were purchased under the Peace Carvin 5 Foreign Military Sales (FMS), currently training for the platform is done at USAF Mountain Home AFB in Idaho with the 428th Fighter Squadron. Several of the Eagles have returned to Singapore in 2010. 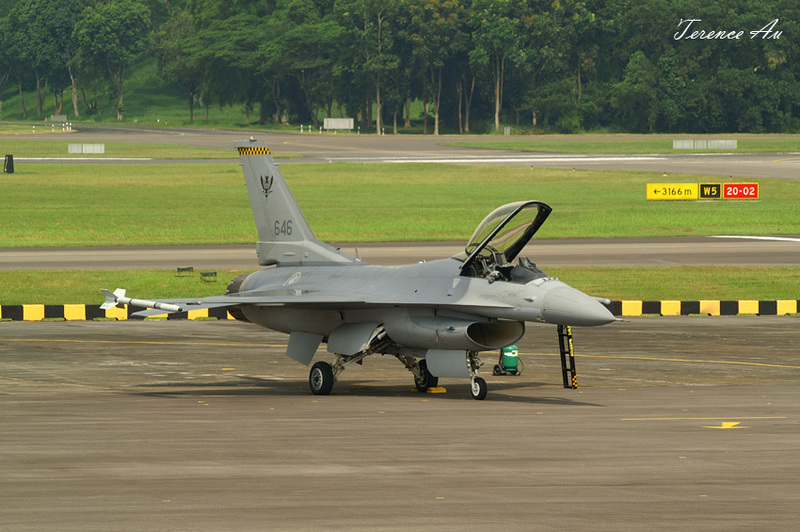 646, a F-16CJ Block 52 Fighting Falcon. The CJ designation is used in the USAF for Block 50 (GE engines)/52 (PW engines) aircraft, just as CG/DG for Block 40/42. 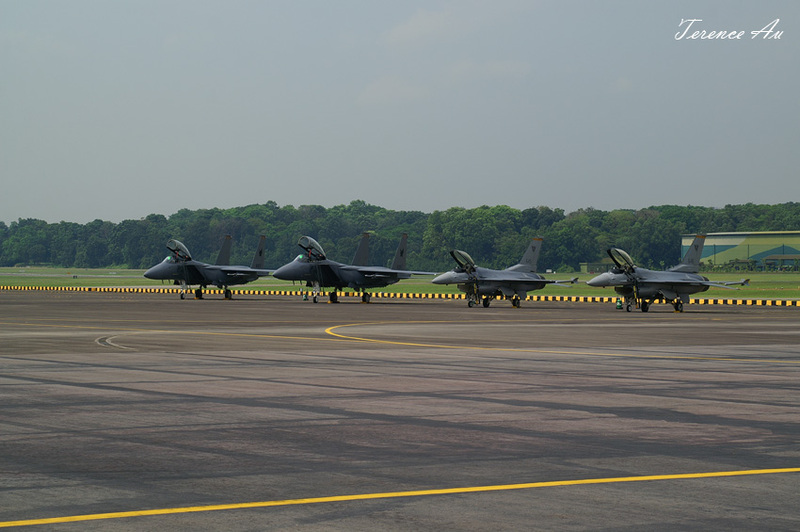 RSAF is one of the largest operators of F-16 aircraft in Asia, with 60 units of different variants. The Strike role is taken by the F-16DJ Block 52+ (known as the D+) from 145 Squadron, while the air defense and SEAD (Suppression of Enemy Air Defense) is generally shared between 140 and 143 Squadrons. 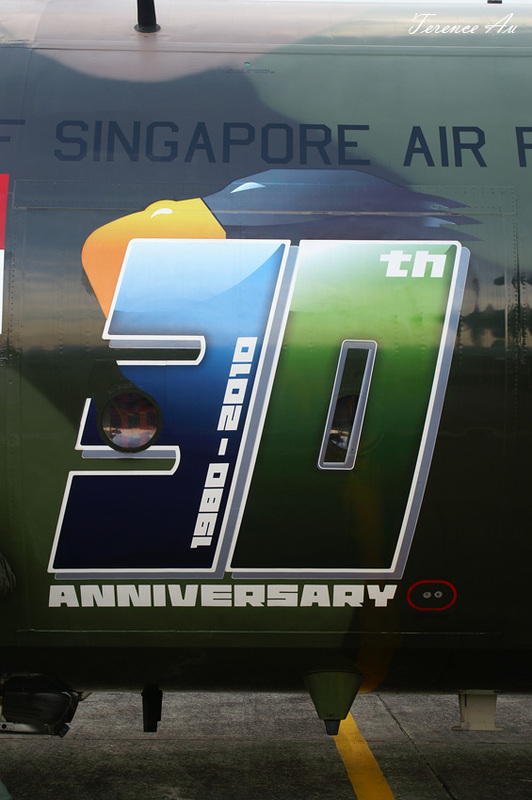 The first Falcons with the RSAF were the Block 15 OCU models, with strengthened Block 30 airframes (making them generally alike the C and D models). They were purchased in 1987 under first Peace Carvin Foreign Military Sales (FMS). Though official records are rare and sketchy, a Japanese publisher went great lengths to obtain information about them, and the Site Admin is happy to share the listing for the RSAF’s first Falcons here. The surviving seven Falcons were sold to Thailand in 2007. Subsequent Peace Carvin programs (2 to 4) include F-16CJ, DJ and DJ Block 52+ models stretching over 1994 to 1997. Information about these are from the publication “F-16 Fighting Falcon/Ikaros Mook Military Aircraft of the World (イカロス・ムック 世界の名機シリーズ)”. Scamble! Have you ever thought about guys and girls who keep the air safe, while we enjoy our daily activities? With Singapore’s airspace small and vulnerable, there is little choice but to keep alert at all times. Besides, air warfare is often the decisive key to turn the tide of battle in the modern era. At peace time now, defense against extremists or forces with ill intentions is the responsibility of air forces around the world..
With airspace secured over the battlefield by fighter aircraft, helicopters can effectively do strategic airlifting and interdiction of troops and equipment. 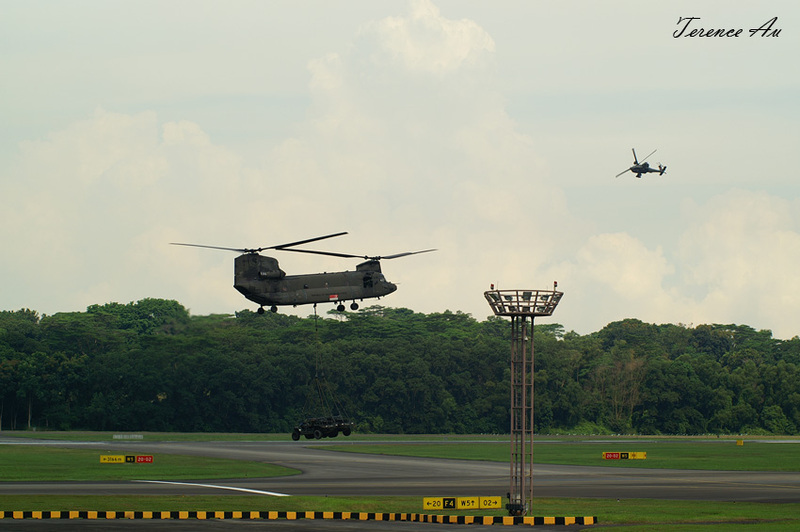 Here is a Boeing CH-47 Chinook with two Light Attack Vehicles underslung while a AH-64D Longbow Apache guards the landing zone..
After a demonstration of scramble takeoff and interception, the four aircraft do a flypast with the Missing man formation, a tribute to airmen who were lost in the years of operations. Indeed, only airmen and aviation fans stand at attention during this moment, others just wonder why.. Blame the rigid education system! 8325, another SG Eagle, with a myriad of Mark 82 bombs and a pair of AIM-9M Sidewinder missiles.. 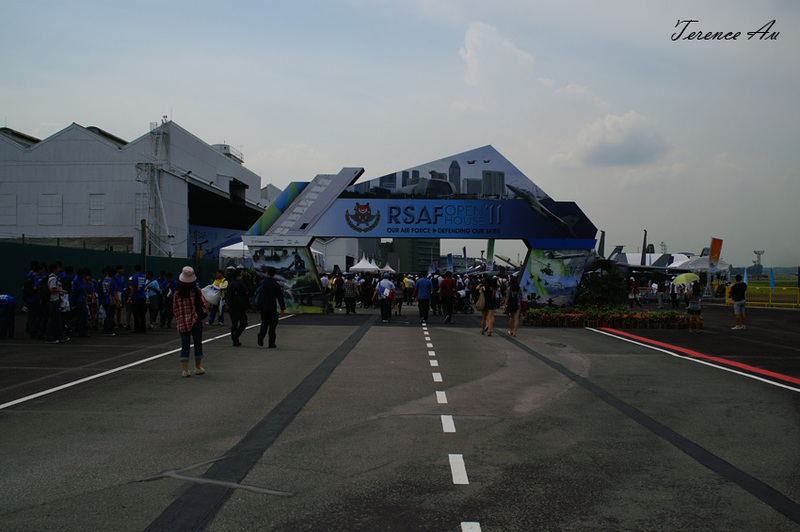 The MJ-1 Weapons Loader under the wing looks small overall..
2010 is the 30th Anniversary of the Boeing C-130 Hercules in service with the RSAF, and here is aircraft 724 with the commemorative livery. As the evening sets in, the lineup of the aircraft as the Site Admin exits the event is as such. 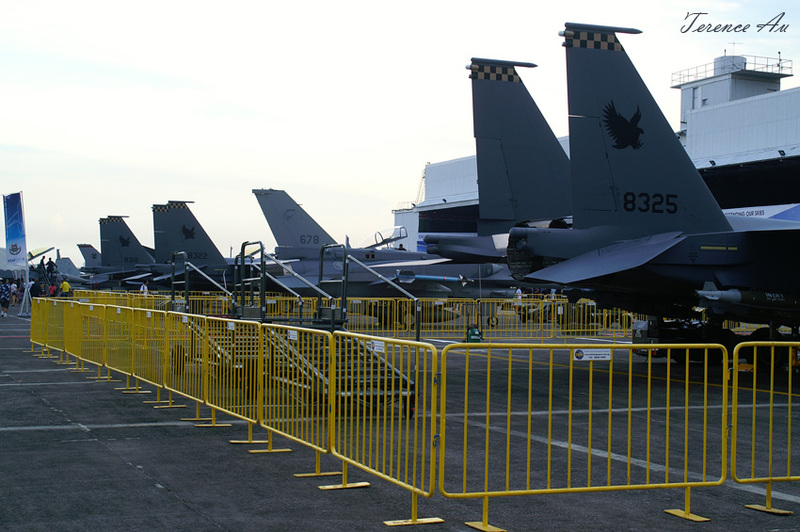 Colors of the F-15SG, F-16DJ Block 52+, more Eagles, a lone F-16DJ Block 52 with tail 625 and F-5S/T Tiger II could be seen in the background.